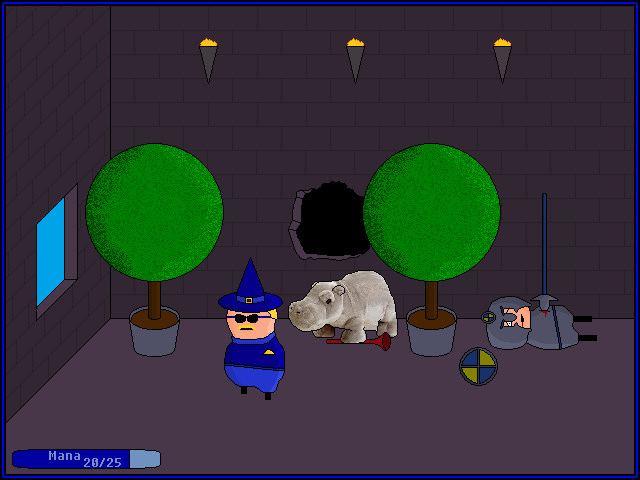 You hop through the HOLE you made in the PUZZLE WALL, followed closely by PADDINGTON. You appear to be in a large HALLWAY of some sort, with a WINDOW at one end, and a series of SPHERICAL TOPIARY, which are really, really awesome. You can only assume that there is something else awesome behind you, but you've yet to turn around. Oh, and hey, you realize that your MAGIC FALCON PUNCH SPELL THING took up 5 MANA. Gotta be more careful throwing those things around! As you used the spell, the MAGIC MARKER disappeared from your KNUCKLES. Looks like you can write other MAGIC WORDS on there if you wish, hopefully casting cheaper spells. That BLAST made a lot of noise, even above the din of distant battle. Hmm. Wait, DISTANT BATTLE? This end of the HALL is cool and all, but you better turn around and see what's going on. 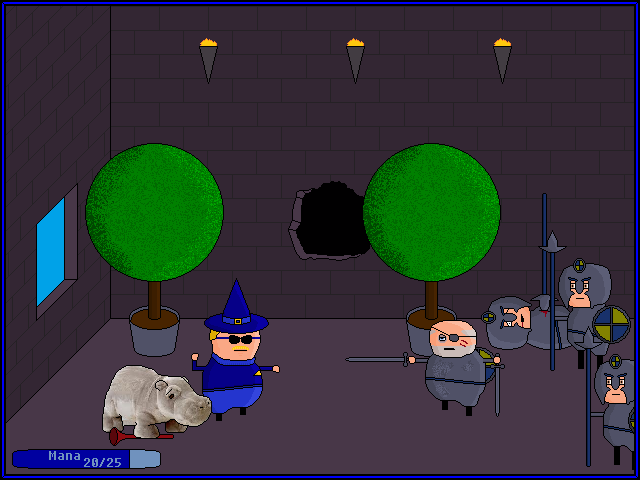 A GRIZZLED WARRIOR and two GUARDS stand before you, near a GUARD CORPSE back by the wall. It appears they were attracted by the noise of your SPELL. The GRIZZLED WARRIOR is pointing a SWORD at you threateningly. GW: Stand down, wizard! Who are you? Where did you and that stuffed familiar come from? Answer me or die; I've no time to waste on the likes of you! Yell "OOhhhh YEAHHH", then point to the hole in the wall. It appears that the dead guard was stabbed by his own weapon. Do they commit Seppuku in this culture? I personally like the idea of using a magic marker to write on stuff to cast spells. Interesting possibilities later on. As for now though that dual-weilding veteran seems like he'd slice us before we got the cap off; so I agree in humoring the puny mortals and peacefully engaging them in converstaion to find out who their enemy is and if they're our captors. One of the problems with having a daily comic based on reader input is that if anything comes up, the comic doesn't get updated. Sorry! I'll have the new one up tonight. Feel free to keep making suggestions!